No more picking up spilled pins one by one - sweep them up with your Mini Grabbit! Grabbit Mini Magnetic Pincushion 3 Count ... Triple the Fun of the Original Grabbit! 3" Diameter - 3 Mini Grabbits per box (one red, one yellow, one blue) Use at the sewing machine, on the ironing board, at easy chair, in office drawer, in junk drawer...unlimited uses!!! We adore Mini Grabbits and so does our sewing public! 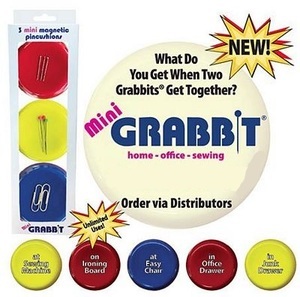 The three pack Mini Grabbits will never replace the original Grabbit Magnetic Pincushion. They were designed with a smaller footprint for use at the sewing machine, ironing board and easy chair when doing handwork. Whether you sew or not, Mini Grabbits have a whole other life for non-sewists. Mini Grabbits are found in tool sheds collecting nails & screws, on desks hording paper clips and in junk drawers collecting all those little metallic mysteries.